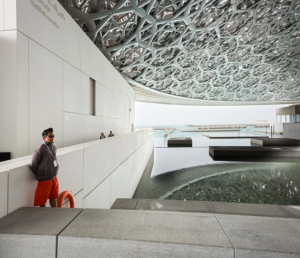 The following blog was originally published on Darren Bradley’s website to highlight the Louvre Abu Dhabi. Darren Bradley was a participant in a week long cultural delegation to the UAE, organized by the Embassy of the United Arab Emirates and Meridian International Center. The delegation consisted of public figures, art collectors, and select museum and gallery professionals from around the United States. This blog post was written by Darren Bradley. Architect Jean Nouvel’s latest creation, the National Museum of Qatar, just opened to much fanfare and images of this new project are flooding my instagram feed as I write this. But since my invitation to the opening gala apparently got lost in my spam folder, I’m going to talk about Nouvel’s previous iconic project, instead: The Louvre Abu Dhabi. The Louvre Abu Dhabi is located on the newly established Saadiyat Island Cultural District. 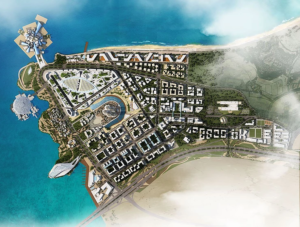 The city is establishing separate, master-planned districts on different islands, such as Yas Island for entertainment, Saadiyat for culture, etc.). Rendering of the planned Culture District, with Gehry’s Guggenheim Museum at the top, Nouvel’s Louvre in the middle left, and Zaha Hadid’s Performing Arts Centre at the bottom left. Of the three, only the Louvre has been built so far. Like everything else in UAE, these master-planned communities are extremely ambitious, with pharaonic projects that are only partially completed at this stage. There is still construction everywhere, and most of the museums and other buildings of this cultural district have yet to be built. But judging by what’s there already, it looks like it’s going to be impressive. But back to the Louvre Abu Dhabi. The museum was designed by Jean Nouvel, and opened in late 2017. It is able to use the “Louvre” name thanks to a series of agreements between the governments of France and the UAE. But the name is only temporary, and will expire in 30 years unless renewed. Model of the three projects (by Hadid, Nouvel, and Gehry). Only Nouvel’s project has been built. 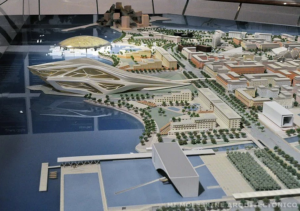 Hadid’s project is now in doubt, and Gehry’s project is being revised, apparently. As part of the agreement, the Louvre in France loaned this museum a number of works for display, to supplement their own collection. 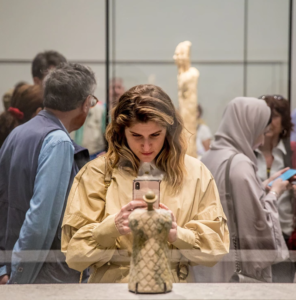 Over time, the ratio of Louvre Paris objects to Louvre Abu Dhabi objects is expected to reverse itself until, finally, there won’t be any Louvre Paris art pieces left, or at least very few. Despite the fact that this museum shares its name with the Louvre in Paris, and also many works of art from there, the museum staff (who are also mostly French) are very quick to point out that the two museums are not affiliated. They are intended as separate institutions, apparently. The collection includes contemporary art, which you would obviously not typically find in the Louvre in Paris. These naming rights and exchange has been the subject of some controversy in France, as some have accused the Louvre of selling out their cultural institutions. But most people seem to view this as a cultural exchange, and don’t mind (including my own French relatives). OK, enough of the contextual stuff. Let’s get back to the architecture. Art museums are often criticized for having their own architectural designs take precedence over their function as display galleries for their art. To that effect, they can often overshadow their collections, and can be ill suited for their intended purpose. Frank Gehry’s design for the Guggenheim Bilbao is certainly an example of museum architecture being more famous than the collection it contains. And it has served that museum well over the years, with the number of tourists who have visited simply because of the architecture. Valencia followed that example for their City of Arts & Sciences, by Calatrava… It’s a stunning building – or collection of buildings, rather. And it’s put Valencia on the map in terms of archi-tourism. But nobody ever talks about what’s inside those buildings! This model has been followed countless times since Gehry’s seminal Bilbao museum, but it started long before him. 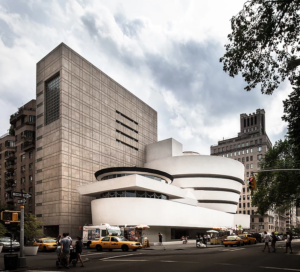 Just look at the original Guggenheim in New York City, by Frank Lloyd Wright. I absolutely love the building. But it’s said to be a terrible place to display art. The walls are curved and the dramatic architecture is constantly competing for the viewer’s attention. Where am I going with this..? Oh yeah, the Louvre Abu Dhabi. So of course, they have their “starchitect” in Jean Nouvel designing this institution, as is almost required these days (Sorry… I know that architects hate to be referred to as “starchitects”). The choice of Nouvel for this project is a logical one, considering its location in the United Arab Emirates. 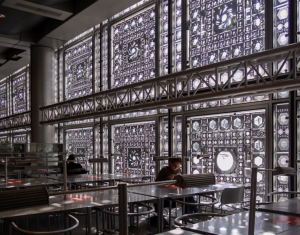 Nouvel’s first major commission was the for the Institut du Monde Arabe in Paris (IMA). Jean Nouvel’s first major commission, L’Institut du Monde Arabe in Paris (1987). The IMA’s defining feature is the use of metal apertures like camera shutters, which can open and close to let more or less light into the glass building. 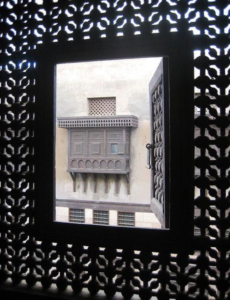 The shapes of these shutters mimic the star designs and intricate patterns of the wood lattice work found in traditional “mashrabiyas” (those projected wood balconies found on traditional vernacular architecture throughout the Arab world). 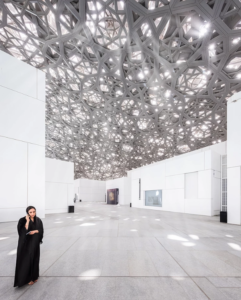 In the case of the Louvre Abu Dhabi, Nouvel used those lattice mashrabiya patterns again in this new work, but this time by incorporating them into the giant dome that is the defining feature of this museum. Rather than making them mechanical (those shutters in the IMA are frequently jammed and broken, anyway), Nouvel this time created multiple layers of lattice patterns that overlap. The result is an extremely complex design that seems to constantly change as the sun filters through it in different ways during the day. Traditional Mashrabiya seen through another one. Nouvel has been quoted as saying that the effect produced was meant to appear “like rays of sunlight passing through date palm fronds in an oasis”. And when seen while the sun is out but there is dust in the air (as there was during my visit), the effect can product dramatic beams of light, like sun showers through the lattice work. 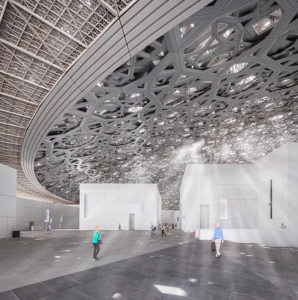 In fact, Nouvel’s design for the Louvre Abu Dhabi is rich in local symbolism, beyond the double meaning of the mashrabiya / date palm references of the domed roof. The giant dome covers a collection of simple white buildings of different shapes and sizes, almost haphazardly arranged at odd angles, meant to represent buildings found in a traditional souk, or village marketplace. These buildings form different alleys and courtyards, which the visitor is free to explore. Also, the entire complex projects into the harbor like a collection of miniature islands, which is a geographical reference to Abu Dhabi’s own situation as a collection of coastal islands and marshland. This connection to the sea is ever present in the museum, as well, and there are several spots where the visitor is invited to sit on steps which descend straight into the harbor (and below the water line, even). Of course, this unique feature means that the Louvre Abu Dhabi is probably the only fine art museum in the world that employs full time lifeguards. Nouvel’s architectural design is brilliant, and creates a new icon for the city, and a wonderful experience. But unlike so many other examples of destination museum architecture, Nouvel’s design absolutely does not overshadow the artwork. The building actually does a great job of providing both a wonderful architectural experience AND a wonderful site to display the art. Once inside the galleries, the building complex functions as any conventional museum space would, as a series of [mostly] windowless rooms that are perfectly suited for displaying art. Light is modulated as required by the works being displayed – mostly through either direct or indirect overhead lighting. Galleries are arranged in a linear fashion which makes it easy to visit in a natural progression without having to back-track. 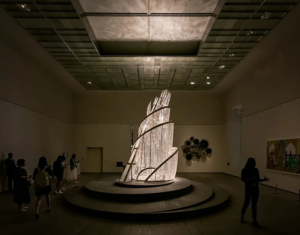 But at times, the artwork is also curated with a unique point of view, similar to how the Barnes Foundation in Philadelphia has displayed their works – in a pedagogical way that draws the viewer to infer unconventional links between sometimes disparate pieces. Views to the outside are generally reserved for transition spaces between the galleries, and provide peaks at little courtyards and ponds, and even the occasional artwork located outside. All of this is done without letting the dome or other architectural feature distract or detract from the art experience. 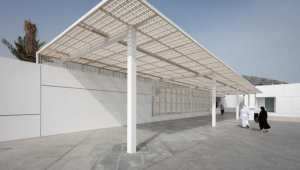 In this capacity, the building serves both as an iconic new symbol for Abu Dhabi, but also as an extremely functional space for viewing, experiencing, and learning about art. So, this is clearly a world-class institution and was my favorite part of my recent visit to the UAE. But should it be called “the Louvre”? I honestly don’t have a firm opinion on that. I went to school in Paris, and am intimately familiar with the Louvre museum. This is not that. But it is extraordinary. Detractors say it diminishes the Louvre name by applying it to other buildings outside of the original. But I didn’t hear those same objections when the Louvre created an outpost in Lens (designed by SANAA in a city in northern France formerly known mostly for WWI battlefields and industrial mining). I suppose I can understand why they felt the need or desire to use that name. It certainly gets everyone’s attention, and also perhaps lends this new institution an air of legitimacy and gravitas that it may not otherwise have. But I have to say, I think this museum is good enough to stand on its own, without needing to borrow the “Louvre” name.